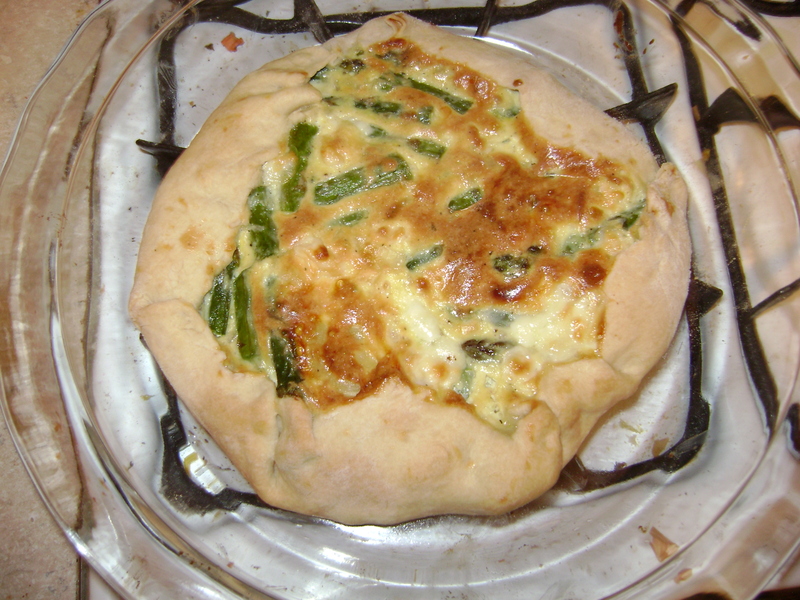 My obsession with asparagus casseroles continues …. this time it was completely unplanned though. I was looking through my Greens cookbook for recipes for asparagus and they had a remarkably similar recipe for asparagus tart. By tart in this case they actually mean quiche. There were some slight differences, mainly they called for orange zest instead of lemon zest. Naturally I ignored this change and just used lemon zest. It called for gruyere cheese; I used fontina. 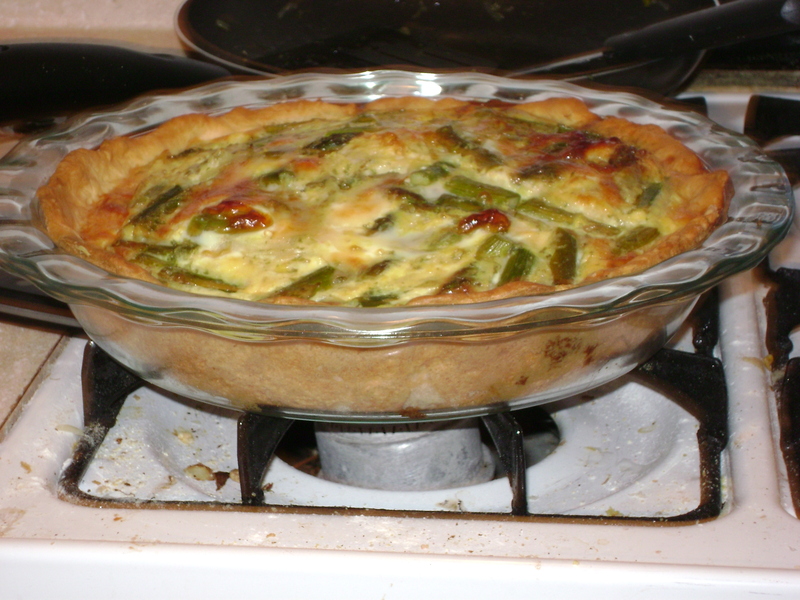 Other than that, the main change was the much higher milk/egg to veggies ratio because quiche is like that. They also had a different dough. Instead of pie crust, they had a specific “yeasted tart dough.” I must say I was not very impressed when all was said and done, too dry when it finished baking. Pie crust dough is better. I think of the three recipes this was my favorite. I think would add more asparagus and cheese in the future though, and have slightly less egg/milk mixture. Still, this is getting down to changing and 95 to a 100. Serve with a glass of white wine and a small green salad. The wonderful thing about casserole fillings is that there are so many ways of adjusting and playing with them. Also asparagus continues to be on sale as it is spring and asparagus is a spring veggie. So since the matzo casserole filling was so delicious, I decided to make it again, albeit in a slightly different form. The asparagus filling was very nearly the same as the first time around. Sauteed asparagus and onions, mixed with egg and cheese. I used mozzarella and ricotta this time instead of fontina, cause that’s what I had. And of course lemon zest. Seriously, I’ve said it before and I’ll say it again, lemon zest is amazing. My obsession is aided and abetted by the fact that a few months ago I bought a microplane zester for myself. Best decision ever. It seems like an unnecessary gadget, but it has quickly become one of the best kitchen toys I’ve ever bought. The only warning about it is that you need to be careful … I keep accidentally grating my knuckles a little, which is not fun. Between cooking and playing lacrosse in high school I’ve acquired tons of little scars on my hands over the years. But a zester is still completely worth it. Just be careful. Rather than make it as a casserole, I decided to use pie crust dough as the top and bottom. However, I miscalculated slightly, and didn’t actually make enough pie crust dough to have both a top and a bottom for a savory asparagus pie. However, cooking experiments are all about working with what you have. So rather than a pie, I made a galette, something I haven’t made since I was playing with parsnips back in January. Basically, you roll out a big circle of dough, dump the filling in the middle, and fold the edges of the dough over the filling , so that only a circle of filling at the center is visible. Pie crust – way better than matzo. I’d never put egg in a galette before, so I wasn’t quite sure how it would turn out, but my worries were completely unfounded. The main difference is the coloration, which was pretty minor. Variation number 2, definitely a success. Again with the lag time between cooking and posting – one day I will be less busy and be more on time with this. So for Easter week, I was searching for something both clearly Easter-y but didn’t involve meat or intense amounts of sugar – its surprisingly difficult. My guess is because after 40 days of Lent, all anyone wants to eat is dessert and meat. But there are also a ton of different Easter breads. The Russian Easter bread is kulich – which my parents make every Good Friday. However, it is the most finicky, brutal recipe in the world. According to family lore it takes ten years to learn to make properly. So I was not about to attempt that. Instead I decided to make hot cross buns! I loved hot cross buns growing up, but my mom always put currants in them – blech. Since hot cross buns are traditionally eaten on Good Friday, I made them Thursday night, so that all I had to do on Friday was stick them in the oven and bake for twenty minutes. 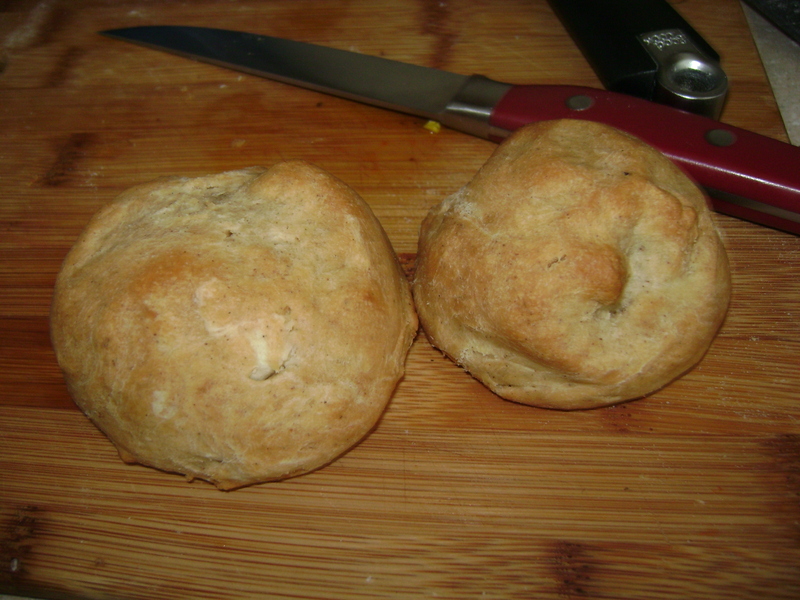 The recipe I used was fairly straight-forward; let yeast get bubbly, add flour, egg, spices, etc. Let rise – punch down, divide into rolls, let rise again. The result – yummy! The only thing I got wrong is I didn’t add the little icing crosses on the rolls. I tried making icing, but I added too much milk and it got all thin and runny and so was ineffective as bun decoration. Oh well. All in all, I have a feeling I’m not going to wait until next year’s Good Friday to bake these buns again.